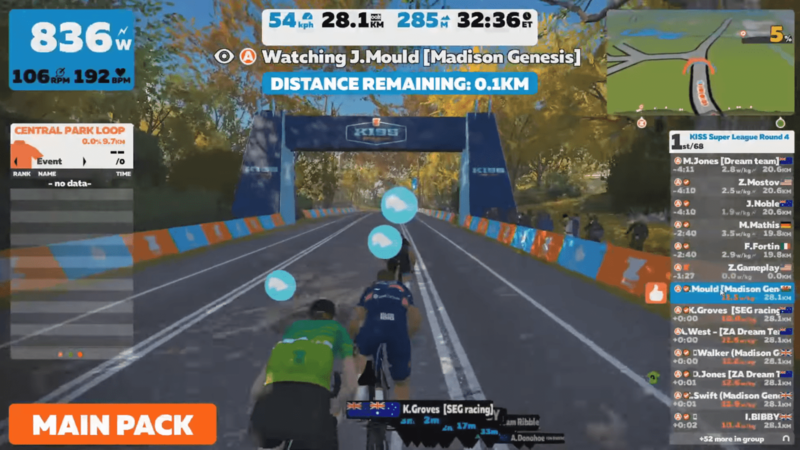 Editor’s Note: Originally posted on the Bereda Training Journal, we got to sit down with Jon Mould after BOTH his wins in Rounds 3 and 4 of the KISS Super League to talk racing dynamics, Madison Genesis’s dominance, and his outlook on the future of eSports cycling. Jon Mould has traveled “here, there and everywhere” as a pro racing his bike for team Madison Genesis, the Continental squad based out of the UK. But this winter his bike is fixed in one spot, on his indoor trainer, and he’s taking on a whole different kind of professional race: Zwift’s KISS Super League. Could Zwift’s virtual racing series ever compete with the targets Jon has on the road? “With the amount of coverage it’s getting at the moment it won’t be long I don’t think!” Jon told us in an interview. If this format takes off, Jon could take off with it. He’s won back-to-back races in the third and fourth rounds of the series and is part of a dominant Madison Genesis roster. Jon hasn’t always been attracting eyeballs from around the globe, racing virtually on Zwift, but he has been in the sport for a long time. “Well, I’m from the UK, from Wales, and I’ve been a full-time bike rider since I was 18 with progress through the British Cycling Academy,” Jon told us. 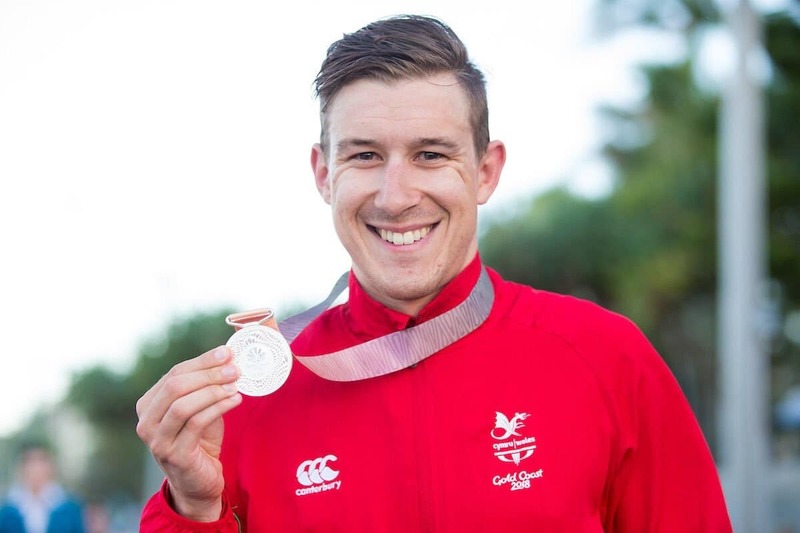 He was on their U23 development team and raced throughout the world both on the road and on the track, doing World Cups, competing in European Championships, and even representing Wales at the Commonwealth Games. But now Jon has taken on a third cycling discipline. 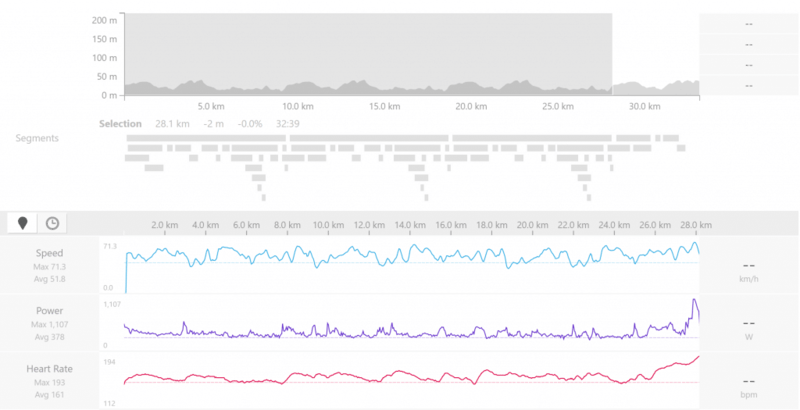 “I’ve had a winter off the track this winter so I guess I’ve replaced it with Zwift,” he chuckled. 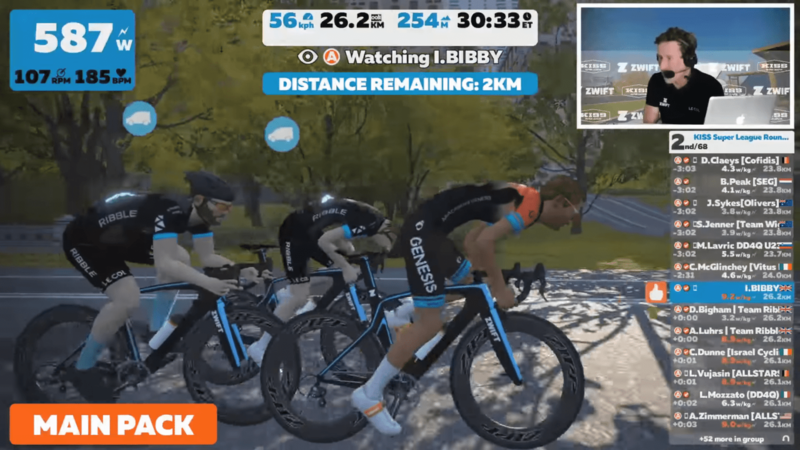 Madison Genesis announced themselves to the KISS Super League in round 1 with Ian Bibby sprinting away on an uphill finish to take the win in the first-ever virtual professional bike race. Jon was 6th on the day. Madison Genesis had all four of their riders in the top 7. A big driver of this, no doubt, has been Jon’s wins in the past two rounds of the series. That said, they know their experience is a competitive edge that won’t last forever. 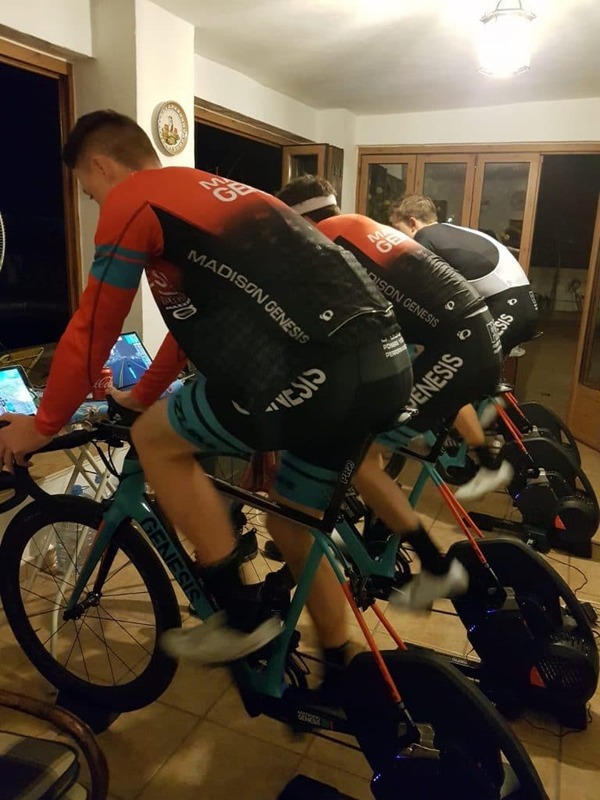 Before taking the line for round 3 of the KISS Super League, the whole Madison Genesis team had just returned from a week-long training camp in Calpe, Spain. “It was a solid 10-days of training,” Jon said. But a sprint wasn’t for certain. Dan Bigham of Ribble Pro Cycling was away with a few KM to go and nearly stayed away like his teammate Ed Hopper did the week before. They ended up finishing 1, 2. 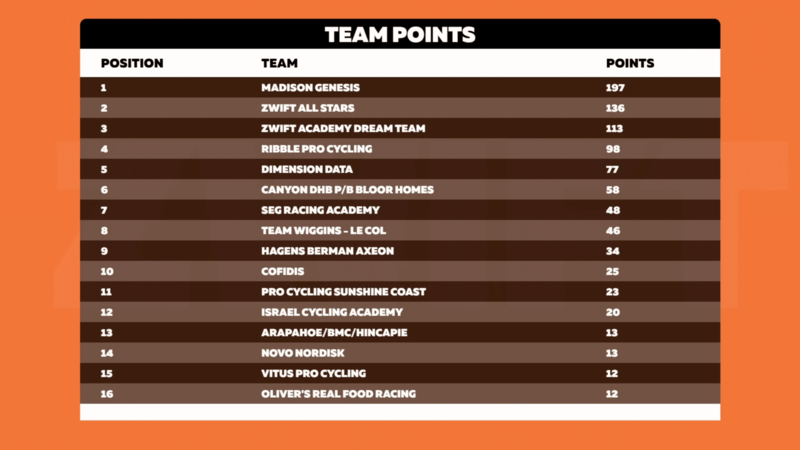 Madison Genesis shot ahead in the standings. It’s always a good sign for a team if it’s a bigger accomplishment to beat your teammate than the actual competition. 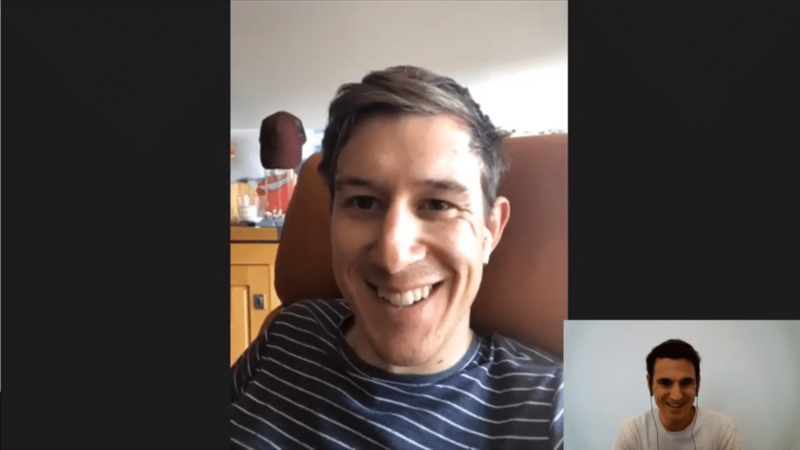 This 3-minute video captures all the moments from our interview with Jon where he talks about how he an Ian Bibby taught the other Madison Genesis riders how to Zwift and the friendly rivalry between them. Watopia Flat is a course with a fast, downhill finish. With Dan Bigham still holding onto a 6-second gap in the final kilometer, Madison Genesis launched their sprint (with others) with a little over 400 meters to go. 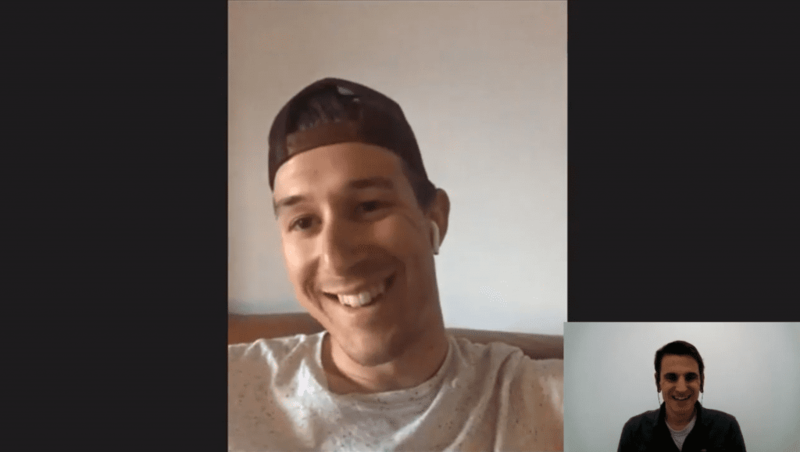 So, silver lining, we got to sit down with Jon again and hear how his win in Round 4 shook out. In round 3, Jon averaged 356 watts and 156 beats per minute. “Ya, a real tough one,” Jon acknowledged. And legs he had, indeed. Round 4 saw some aggression in the final kilometers. With 2.8km to go, Jon’s teammate Ian Bibby took off heading into the final intermediate sprint. That move was quickly countered by Team Ribble riders Alex Luhrs and Dan Bigham, who cleverly used two drafting power-ups in unison to cross the gap. None of the three had the most desired Aero Power-Ups for the finishing sprint, and so decided to try their luck from distance. It ended up creating a pretty threatening breakaway with 1.8km to go. With the two Ribble riders, Bibby, well-known powerhouse Connor Dunne and two All-Star riders Zimmerman and Vujasin in the mix, this group could have made a real push for the line. But behind, no one was laying off the gas. 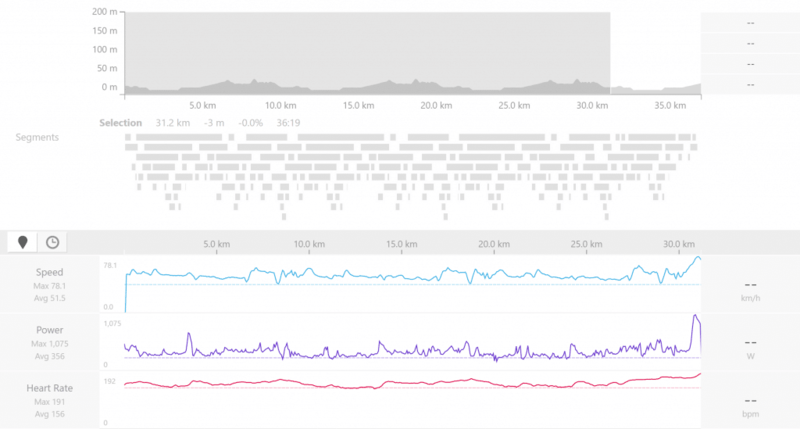 540 watt average ending in a winning sprint? Not for many of the other racers, either. 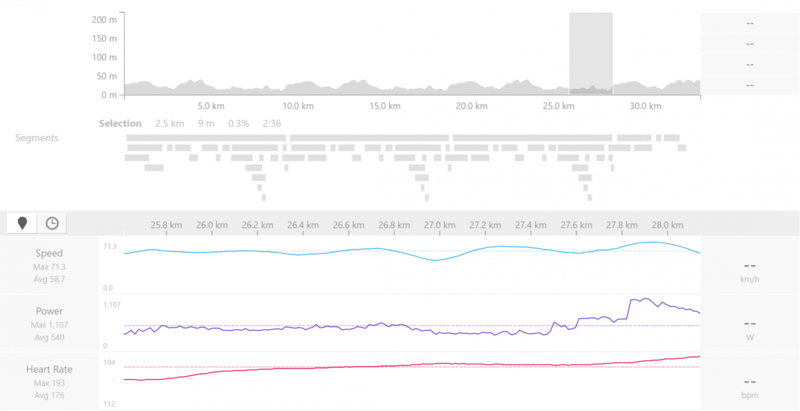 Jon won quite convincingly, dropping 920 watts for 19 seconds in the closing meters. Alex West of the Dream Team was closing in quickly, though. He had similar numbers in the final two and a half minutes and put down a 13-second spurt at 943w in Jon’s draft to nearly pip him at the line. It was Alex’s third 3rd place in a row. Alternatively, Jon went early and held it to the line. With such a hard, fast, race, Jon and the other Madison Genesis guys were just gambling that all the moves throughout the day would come back for a sprint because they knew they had the legs. “In previous weeks we’ve been getting aero power-ups before the race and saving them for the whole thing,” Jon told us. A smart strategy as Jon says these power-ups “make a massive difference” and doesn’t think there’s much chance contesting one of these final sprints without one. Jon got a whole week of holding it over Ian Bibby after his win in Round 3, and now has another week to basque in his glory. We asked: Is Ian itching to get back on terms with a win next week? Madison Genesis first heard about the KISS Super League mid-way through the winter with the rest of the general public. Not long after, the team asked the riders if it was something they would be interested in participating. 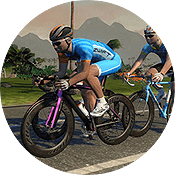 The KISS Super League is an experiment in the viability of virtual racing as a new sub-discipline of cycling. Not all riders are excited about it, but Jon is optimistic. Jon recognizes that this is getting covered in a whole new way to traditional road racing. 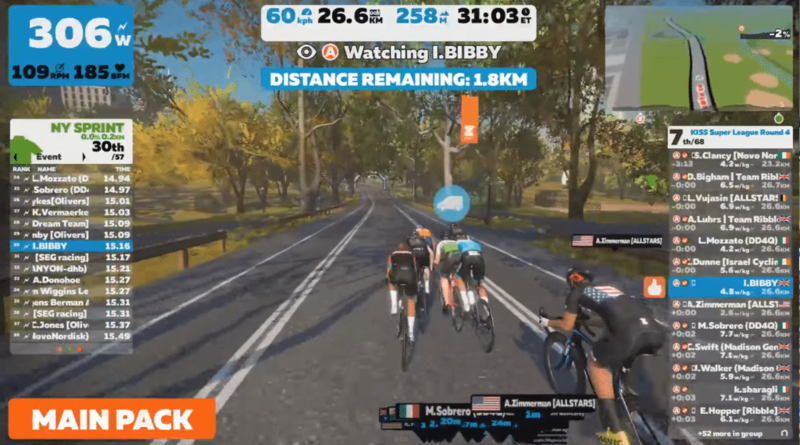 Here at Bereda, we’re hoping that these kinds of rider feeds can eventually get integrated into the main live stream put out by Zwift. Madison Genesis seems to have a stacked line-up, but Jon and Ian have done all four races with Connor Swift and Tom Moses having done three. Then Jon had a fun thought. 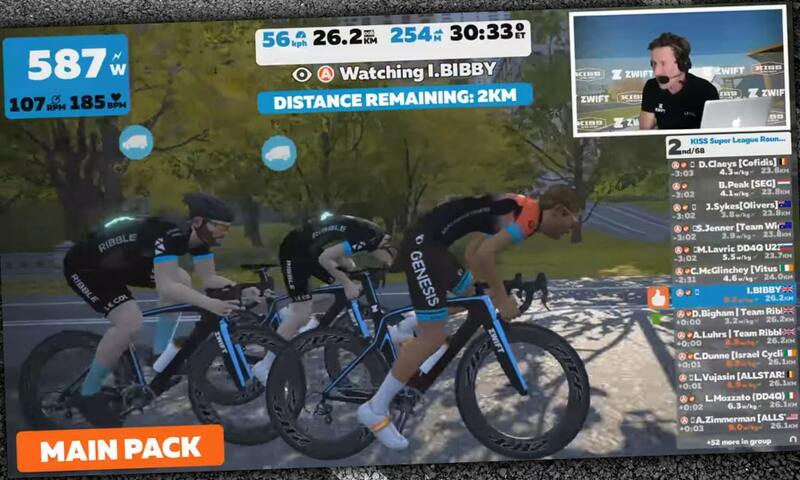 One thing we’re hoping for at Bereda is that Zwift will lengthen out some of these KISS Super League races. With a group full of professional FTPs, the Double Draft feature, flat courses and 35min total ride time, we’re going to be watching a fast moving blob charge to a sprint finish week after week after week. It’s true too, and when you think forward with that progression we start to wonder what the last few races in this series might look like. The guys are learning quickly, he says. The KISS Super League was a very welcomed but impromptu addition to the Madison Genesis calendar. With the road season quickly approaching, Jon says that the Tour Series and the UCI level races Tour of Yorkshire and Tour of Britain are their main objectives. “And then, of course, racing here, there, and everywhere around Europe,” Jon says. But how many years, do you think, before something like the KISS Super League ends up being at the same level as the races just mentioned? 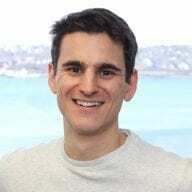 Dennis is the Co-Founder and CEO of Bereda Training, a company building a Peer-to-Peer Coaching platform where Endurance Athletes help each other improve.